Its Christmas and a time for giving and so I have decided to give away my Factory X pewter Starfury ( sorry, no stand ) and two starter decks for the Psi Corps starter game, to one B5 fan. All they have to do is post what Babylon 5 means to them. Examples would be, how B5 has changed thier life. A favorite episode and thoughts about it. A story about meeting a member of the cast etc.... Anything to do with Babylon 5. The contest runs thru Christmas eve and I will choose a winner the day after Christmas. Sorry but I have a bad work schedule so I may not be able to log in Christmas day. I will ship out the package the first week of the new year. I will wrap the starfury in several layers of bubble wrap but I cannot guarantee it will arrive in one piece. Sorry to our friends outside of the United States but I cannot ship overseas or to any other country besides the United States ( sorry, I cant ship to Alaska or Hawaii ) as it might be a little to expensive. 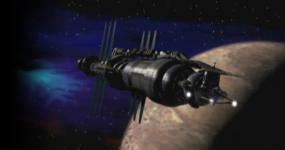 But you are welcome to give your thoughts on what makes Babylon 5 special to you. I have posted a link below so you can take a look at the prize. ( I might add one more item at the end of the contest. ) So, if it is ok with the moderator, let the stories of Babylon 5 and all that it means to us... Begin. Last edited by dencor; December 9th 11 at 08:54. Quite a few years ago and a couple moves previous, I used to build model kits, namely spaceships and geeky mecha models. I tossed all of my in-progress models (why I have no clue now, presumably space and not wanting to pack them up. I don't remember now.) and consolidated all of my mecha models. Recently the bf and I made a trip to the local hobby/model store. I had a shopping list of what I needed to get, and an idea of how much it was going to cost. He was the "token spouse" since he's the one who had no real idea of what was what in the store, but was carrying my stuff for me since I was buying a fair amount of stuff. Keep in mind I was the only female in the store other than the mother who was just there to pay for her son's purchases. We get to the register, and the guy behind the counter ignores me and looks at the bf who had to point out that he was just there to carry cargo, and that this was all my stuff. Register dude had to essentially pick his jaw up off the counter because a lady actually knew what various model supply bits were. I'm currently in the process of rebuilding my supply stash, and sanding and filing the wee beastie and pondering a complex paint/decal job that's waiting for me. Then I'm going to try my hand at lighting a Fury, working on internal lighting, something I haven't done yet. I can happily say that watching B5 has brought back my love of model making. *grins* That's the model kit I'm building with add-on decals.